The landmark Khada Parsi statue may find a new home at Five Gardens near Dadar. 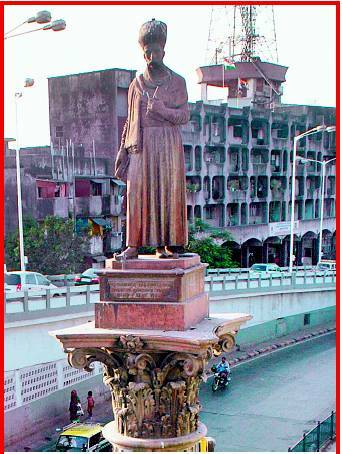 The statue now stands between two flyovers in Byculla.The Brihanmumbai Municipal Corporation (BMC) plans to shift the century-old statue of Shet Cursetjee Manockjee to Dadar so that it could be protected from the corrosive effect of pollution. But the idea has met with opposition from residents of nearby Parsi colony who say the BMC has no right to move the statue. The BMC says the statue has deteriorated because of the effect of traffic fumes and bird droppings. Street dwellers use the limbs of the statue to dry clothes; the foot is occupied by pavement dwellers. Once the statue stood at the centre of a road junction. It still stands in the same place, but has been sandwiched between two flyovers. “It was not even protected from deterioration. If the statue is reinstalled at Mancherji E Joshi garden (Five Gardens), it will be safe from pollution and would be close to the Dadar-Parsi Colony,” said a senior civic official. The plan to install the statue at Five Gardens is part of a larger project to restore the decrepit Five Gardens. Lalita Gupte, deputy architect of BMC who presented the plan on Tuesday, said, “The statue and the garden would symbolise Parsi culture. It would be right to shift the statue statue to Five gardens,” she added. The BMC called residents of Dadar Parsi Colony to view the beautification plan on Tuesday. Mahiyar Dasturji, resident of Parsi Colony, said while renovating the 100-odd year old gardens, BMC should also take into consideration that the garden is a heritage precinct. “The railing and redevelopment should be done to retain the original look of the garden. We want BMC to erect the statue of Mancharji E Joshi, who is founder of this garden and the Parsi colony in Five Gardens. The Khada Parsi can be reinstated anywhere in south Mumbai,” he added. Sharada Dwivedi, city historian says Five Garden is not the right place to relocate the statue. “The statue should remain in south Mumbai. The Alexandra Girls school had told the heritage committee that they wanted to reinstate the statue at their school premises near Bombay Gymkhana,” she added. WHO IS THE KHADA PARSI? The Khada Parsi, the statue of Shet Cursetjee Manockjee erected in the memory of the illustrious Parsi in the 1860s, was made to order after his youngest son Manockjee Cursetjee shelled out Rs 20,000–a princely sum. An original of the fountain ordered by the Government of Chile, was noticed by his youngest son, Manockjee Cursetjee, a judge in the Small Causes Court.He ordered a replica made, with a bronze statue of his father on it, replacing the figure of Ceres in the original. The family later “gifted” the statue to the Brihanmumbai Municipal Corporation (BMC) on the condition that it would be maintained properly.